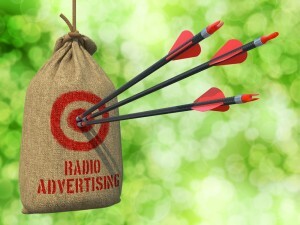 Radio Advertising – Three Arrows Hit in Red Target on a Hanging Sack on Natural Bokeh Background. Contractor 20/20 knows the science behind creating attention-grabbing radio ads that will increase website traffic and boost the effectiveness of your paid search ad placement. Ad placement/scheduling and copywriting are specialties that Contractor 20/20 has worked on for many years. We know how to properly manage these elements to maximize the effectiveness of radio advertising campaigns for plumbers, electricians, and HVAC companies. Through research, we identify your best customers and determine which radio stations will reach them most often. Taking into consideration your budget, we will run the right number of spots to convince new buyers to call. Writing an effective script for radio involves creating the right “Call to Action.” It also involves utilizing customer testimonials and announcer endorsements when appropriate. A good radio script should improve your branding image. When possible we will create a new phone number to include in the ad that is easy to remember. 4) Overall Cost – Radio can actually reduce advertising costs! Using the advertising concept “cost per percentage point” (CPP) of audience reached, we are able to place a competitive bid for your ad placement that will reduce costs. In addition, we are often able to negotiate free bonus spots. Most importantly though, a good radio campaign can reduce your overall advertising costs because it can be extremely effective at creating brand and company name awareness. By boosting brand awareness in your market – be it plumbing, HVAC, or electric – customers will simply remember your name when they have a problem. This means we can cut back on advertising costs that are used to generate leads. Brand awareness also makes it easier for technicians to sell services and close deals. In conclusion, if you take the right steps you can expect success 80% of the time. A good radio spot should produce sales in its first week on air. A good radio or TV campaign can actually reduce your new customer acquisition cost by 35% because these forms of advertisement are so successful at strengthening brand awareness! If you are interested in dominating your market and taking your company to the next level, then radio will most likely be a key component of the plan. Call Contractor 20/20 today and let’s see if radio is a good fit for your marketing, advertising, and growth goals. (607) 770-8933.